John and Kay Antos don’t live off the grid, but thanks to the solar panels soaking up rays outside the couple’s hilltop home in Starksboro, their electric bills are negligible. 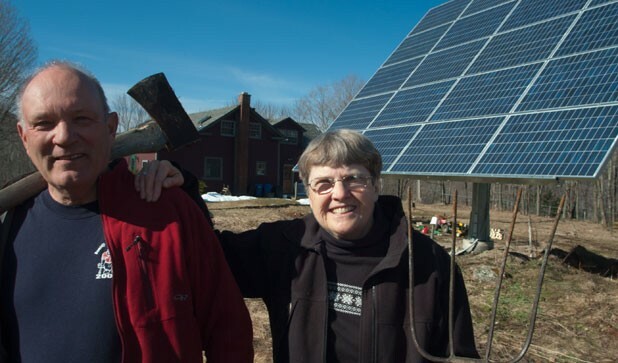 The Antoses are among the more than 1300 Vermonters enrolled in the state’s net-metering program, an experiment launched in 1999 that lets farmers, homeowners and businesses generate their own power using small, grid-connected solar, wind or biomass systems. A few muddy steps from the Antoses’ red clapboard farmhouse is a 20-cell solar tracker that supplies the power for their hot-water heater, lights, electric stove and other appliances. On cloudy days, when the panels don’t generate enough energy to power the house, the Antoses supplement with electricity from the local utility, Vermont Electric Cooperative, just like most of their neighbors. But on bright, sunny days, the panels produce more than enough power for their home. That’s when the electric meter spins backward. The excess power, which is measured in kilowatt hours, goes back into the regional power grid and is applied as a credit to the Antoses’ future electric bills. As part of a power-sharing agreement — called “group net metering” — those energy credits are split between the Antoses and their daughter and son-in-law, who live “25 minutes by snowshoe” up the hill. “It’s awfully green,” observes John Antos, a retired schoolteacher with a gravelly voice. Last week, the Vermont House passed an energy bill designed to make it more attractive for Vermonters to produce their own power using net metering. If the legislation, H.56, becomes law, net-metered ratepayers like the Antoses would get even more value for the power their solar systems produce, further lowering their already minuscule electric bills. The rest of the bill sailed through with support not just from renewable-energy advocates and the companies that make wind and solar systems, but also from the utilities themselves. Utilities benefit from solar net metering because it reduces the amount of expensive power they are forced to purchase at peak times; solar panels are at their most productive on hot summer days when air conditioners are straining New England’s power grid and demand for power is highest. As passed by the House, the energy bill makes several important changes to the net-metering program. First and foremost, it obligates all Vermont utilities to pay net-metered customers a “solar adder” credit for each kilowatt hour of solar energy they produce. Right now, only one Vermont utility voluntarily offers such an incentive for solar power: Green Mountain Power credits its customers 6¢ per kilowatt hour for solar energy they generate. Under the energy bill, each utility would pay a solar adder based on the price it pays for power. For Green Mountain Power, the solar adder would remain 6¢ per kilowatt hour. For Vermont Electric Cooperative, which pays more for its power, the solar adder would be closer to 2.5¢. In addition to that, the energy bill would let net-metered customers use kilowatt-hour credits to offset all fees on their monthly bills — not just energy usage, as is currently the case, but also minimum monthly fees, energy efficiency charges, etc. The legislation also increases the maximum allowable output of a net-metered power system, from 250 kilowatts to 500 kilowatts. A 250-kilowatt system could generate enough juice to power 45 typical homes. Lastly, utilities would handle the billing and administrative paperwork for group net-metering projects, where multiple households or businesses feed off one renewable-power system. Currently, members of group net-metered projects are responsible for tracking energy usage and splitting up kilowatt credits among themselves, a potentially confusing process. Randy Pratt, manager of programs and policy at the Vermont Electric Cooperative, warns that splitting up bills and energy credits would be “tricky” for utilities, especially if group energy systems are constantly dropping and adding new ratepayer members. Luce’s major complaint about H.56 is that it doesn’t go far enough. He argues that capping the size of net-metered projects at 500 kilowatts will curtail the growth of renewable-energy systems. Many states with net-metering programs have no such size restrictions, Luce notes. In Waitsfield, a citizen group called Mad River Valley Energy Network has its eye on a 20-acre piece of land for a solar orchard near Sugarbush. Gaelan Brown, a solar-power consultant from Fayston who used to work at groSolar in White River Junction, says Phase 1 of the project will be a 150-kilowatt solar array — enough to power 30 homes — with subsequent phases adding more panels and more homes. Working with Green Mountain Power, Mad River Valley Energy Network can count on a 6¢ credit for every kilowatt hour it produces. On top of that, GMP offers an additional 13¢ per kilowatt hour for any excess electricity that gets fed back into the regional power grid. Customers can then use those earned credits to offset their utility bills during months when they use more electricity than the photovoltaic panels generate. If Green Mountain Power’s experience is any indication, the solar incentives could inspire more Vermonters to turn to the sun. GMP spokeswoman Dorothy Schnure credits her utility’s solar adder, plus other tax incentives, for a fivefold increase in the number of solar customers since January 2009 — from 66 net-metered customers then to 366 today. Every alternative-power project in Vermont has to be approved by the state’s Public Service Board. Since 1999, the PSB has green-lighted 1371 net-metered power projects, according to board clerk Susan Hudson. All but 154 of those are solar; the remainder are wind, wind-solar hybrids, biomass or methane-fueled “cow power.” Last summer, the state witnessed a huge surge in applications — almost triple the normal number — as ratepayers sought to take advantage of lucrative tax incentives for solar, Hudson says. Thanks in part to such incentives, the Antoses decided last fall to lease an AllSun Tracker solar system from Williston-based AllEarth Renewables. Like its name suggests, the freestanding solar tracker follows the sun throughout the day using GPS and a motor — and in doing so, produces 40 percent more energy than fixed rooftop panels. After investing $1000 up front, the Antoses pay $82 a month to lease the solar system; after five years, they’ll have the option to purchase it for a discounted price. The couple pays a minimum monthly charge of $16 to Vermont Electric Cooperative but hasn’t paid a dime for power since February. Their highest electricity bill — in deepest, darkest winter — was about $75. The Antoses and their kids aren’t currently saving a ton of money by producing their own power. H.56 would definitely improve things, though Luce predicts the solar adder is “a little bit too weak” a financial incentive to turn traditional electricity customers into power providers. But money is not the only thing motivating DIY guys like John Antos. He sees a bigger benefit in net metering.